We’ve known for some time that good quality natural landscape in urban areas can affect how people feel. It reduces stress and sadness, lifts the mood and makes us feel better. The benefits of these green and blues space, and the mechanisms by which they work, are varied. Some are the physical benefits from green infrastructure, for example improved air quality, less noise pollution and reduced risks from flooding or heat-waves. There are also benefits to active users of these spaces, whether that’s physical recreation or through children interacting with nature. The impacts on mental wellbeing, social networks and sustainable communities probably work through a variety of mechanisms and it’s in these areas that the strongest evidence is emerging that urban green space can improve the public’s health. We know people who live in the areas within our cities and towns that have more green or blue space have better mental health. This has been summarised in the recent evidence submitted by Public health England to the Inquiry into Public Parks being undertaken by the Select Committee on Communities and Local Government. The Landscape Institute have also published a position statement on ‘Public Health and Landscape; creating healthy places’. This states that “healthy places make people feel comfortable and at ease, increasing social interaction and reducing antisocial behaviour, isolation and stress”. It also says “healthy places are restorative, uplifting, and healing for both physical and mental health conditions”. The Landscape Institute offers many examples of the important role that the natural environment can play in supporting principles of good design including examples of community gardens, landscape design reconnecting communities with green spaces, and the use of green space to treat mental illness and break drug dependency. More recently, we have seen renewed interest in how the natural environment can be used effectively to treat some mental health problems and assist the care and management of dementia. A forthcoming conference on mental health and dementia, supported by Natural England and PHE, will look at this evidence and examples of innovative practice in using the natural environment as a component of therapeutic interventions. Examples include group activities outdoors, structured walks, horticulture and green gyms. This potential therapeutic benefit for mental illness and dementia should not come as a surprise as there is also evidence that acute hospital patients feel better and are discharged sooner when they are able to see greenery outside their window or enjoy a hospital garden. And the added bonus for public health is that retaining and developing the natural environment in our urban areas also helps us to combat climate change. This is partly because trees and shrubs help to capture CO2 and other pollutants such as particulates. It’s also because urban green and blue space can reduce the ‘Heat Island Effect’ of construction materials (especially concrete and asphalt). 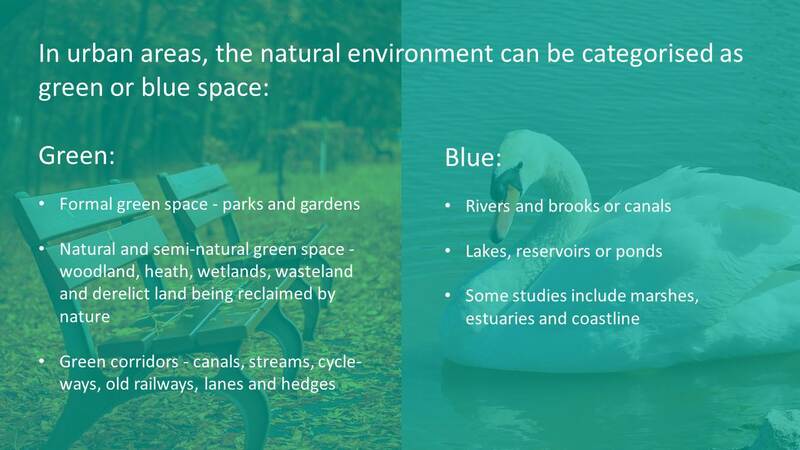 And green and blue spaces help absorb water and capture run off from heavy storms both through the water absorbent effects of roots and soil and because sustainable urban drainage schemes act as natural retaining ponds. 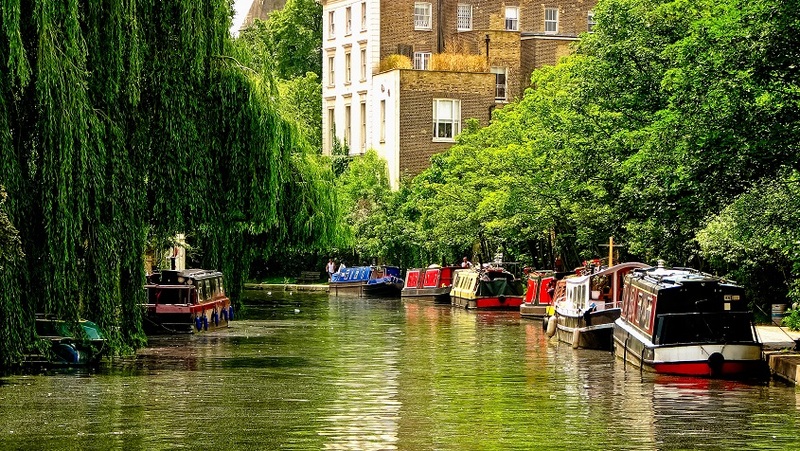 So there is a wealth of evidence of how the public’s health can be improved by increasing access to green and blue space and improving the quality of our natural environment. However it’s also an area where we have much to learn and we look forward to working with partners to take this agenda forward. This blog is one of a series being produced in the run up to the conference; Transforming Mental Health and Dementia Provision with the Natural Environment. Green space, blue space, mental wellbeing and sustainable communities are important areas for continued research. Great to see a conference on the topic. I was heavily involved in the Forestry Commission's peri-urban programme in the Thames gateway, Coalfields and north west. The impact of providing green space - especially repairing damaged land - has been spectacular, and not just for health - private sector developers have seen the benefits to the saleability of their houses & offices; looking at London property supplements it is amazing how many ads now show the green space near a development rather than the development itself. One key, and vital issue, however is that a lot of debate in this area stops at the city boundary - we need to be thinking as much about what goes on in the wider spaces around towns and cities - and with new development its worth remembering that high density = closer to the edge and potentially larger scale green space. Also, that peri-urban greed space tends to cost 5-10 times less than green space within the city. There are huge gains to be made here - the Natural Capital Committee estimated a £500m pa gain from 250,000 has of peri-urban green space - but also challenges that lay bare some of the biggest problems facing Government: first, the huge problems around preventative vs acute within the health sector, but the the huge challenge of working across Government to bring all the benefits together through several departments working together. How fantastic to see this in print! Having worked with different groups in the outdoors, we have known this for years. Can we now please give all people the chances they need to spend time outside. If it was statutory, organisations would have no choice but to include quality outdoor provision in their planning. Hope this is the start of something amazing! Well said Charlotte we ALL need our open spaces its basic Human requirement and i think the Green roof idea is spectacular it links green spaces and more should be done to get these done and now.